I wish someone would invent some "thing" to make shade for a person's face. An obvious Chuck Norris Round house kick injury. That guy was lucky to survive. Me? Oh, I never wear a hat. Am I the only one seeing the Hamburger? Just how manys days went by without his friends saying - "Dude, you might want to turn your hat around." Officer, I'm tellin' ya, you got the wrong guy! 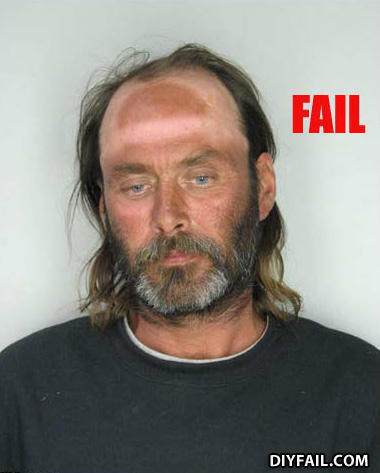 The witness sez, Da thief wuz wearin' a back-erdz baseball cap! Does ya'll seez a back-erdz baseball cap on ma head? He shaved the wrong way round?